This course takes place at Georgetown University's McDonough School of Business in Washington, DC. 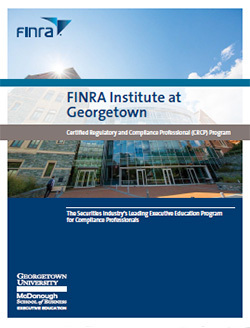 Over five days, Georgetown University business and law school professors and financial services industry experts explore a series of advanced-level regulatory and compliance topics that help participants build on previous coursework covered during Week I.
assess implications of the latest regulatory challenges, trends and developments. View the schedule at-a-glance for our November 2019 course. On the final day of the Week II course, participants must complete a written assessment. Participants who pass both Week I and II assessment are awarded the CRCP designation.